Arizona governor Jan Brewer has signed into law a bill that effectively ends Mexican-American studies classes in Arizona’s public schools (HB 2281). 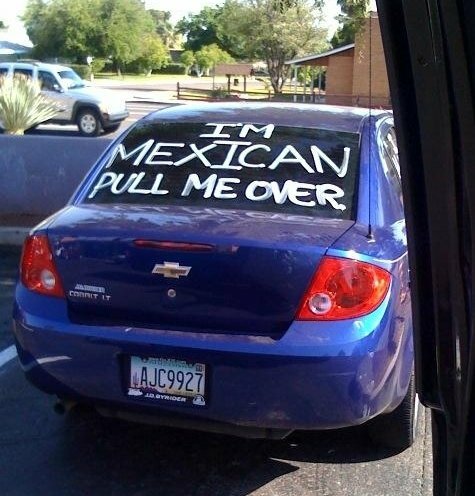 She did this after Tom Horne, a school superintendent and candidate for Attorney General, made noise about his dislike of a Mex-Am culture program in Tucson. Horne and Brewer justified their action by claiming the classes promote the overthrow of the US government, preached resentment toward white people; particularly well-off ones, and urged ethnic solidarity at the expense of a melting-pot mentality. The governor’s actions were enough to make the UN Human Rights Commission sit up and take notice, for all the good that might do, and this in turn excited the usual hot-headed cracker contingent itching to defend their sunbaked desert homeland from invasion by unwashed, un-Englished beige savages. To Brewer and her friends, ending “subversive” classes is defending the status quo — which is exactly why it stinks. Brewer’s actions are an affront to history. By eliminating any but the state-sanctioned version of Arizona and US history, she’s going beyond the so-called conservative “hands off” approach to government intervention in people’s lives and setting the state up to be the official arbiter of the past. Usually, forms of state-controlled propaganda are admitted for what they are but, in Arizona’s case, historical revisionism to the lowest common denominator of understanding means Brewer’s ethnic look-alikes get to pretend their version of the past is all that matters. Historians are taught that perspectives matter. Perspectives are a standpoint from which observations, measurements and records are taken. Worthwhile historians admit that, so long as one is honest about one’s perspective and is objective enough with what’s found and issued from that perspective, analysis and record are worthy. The histories of the American Southwest written by Spanish, Mexican or American historians would agree on many points; they would differ in perspective and focus on issues important to their countries and cultures. Other histories about other times and places do the same. Facts are facts. What is derived from them is specific to the chronicler. This is why we encounter books with such titles as “The History of the War of Northern Aggression” or “A Feminist History of the Civil Rights Era” or “A Diplomatic History of the United States, 1791 – 1991.” The first book in that list lets you know it’s the work of a Southern sympathizer, since only Southern apologists would use such a title about the Civil War. A “feminist history” emphasizes issues critical to at least half the population as a standpoint from which to mark the events of the era. And a “diplomatic history” would have little to say about issues at home and much to do with issues abroad. They’d still be worthy reads because they’ve declared their perspective and may therefore present a clear and coherent analysis. But history is badly used by those who suppress or deny perspectives. The Soviets did that in their satellite countries when they prohibited teaching about nationalist movements and traditional values of subject peoples and forced children to learn the conqueror’s language and to abhor the religion by which their ancestors lived. The winners write the histories, we are told; and, in Arizona, Jan Brewer plans to force every kid in the state-run system to learn the sugar-coated stuff that passes for public-school history — with no regard as to whether the learner is a living, breathing exemplar of a very different historical perspective. And that is what is so ugly about this ugly woman in her increasingly ugly state. By suppressing what is obvious to the Mexican-American kids (who know damned well their history is far different from that of Jan Brewer and her base of furious flunkies) she’s raising a generation of kids who will increasingly identify with those who were suppressed and were made second-class citizens, that is, if they’re citizens at all. By pimping the politics of division, she drives away the kids who might otherwise identify with all things American in the long run — just as has every other ethnic group. It’s a perfect way to balkanize peoples here — with enmity and violence for all, in the long run. It doesn’t take much to see what happened to the Mexican perspective of southwestern history: The white American inheritors of the Treaty of Guadaloupe Hidlago occupy it, for one thing, and have spent the last 160 or so years making those who formerly resided in el sudoeste unwelcome. Brewer takes issue with a textbook in Arizona ethnic studies classes that claims America is occupied; but American Indians and Mexican Americans have known that for a long time and life goes on. Mexican-American students merely have to ask their abuelo about the Bracero Program to learn about what the US does when it needs labor. And they can read the headlines about the Border Patrol, ICE and “the fence” to see what happens when labor becomes redundant. They can always seethe with resentment when, although born here and as American as the next guy, they’re racially profiled at traffic stops, red=lined for home loans (based on heritage) and excluded from society because of others’ flawed perspective. Brewer isn’t merely suppressing perspectives of history and cultural awareness. She’s working to enshrine a state-mandated official doctrine of how it is — and who is allowed — to be an American. It’s a replica of Soviet-style thinking and a prelude to disaster that will increase the animosities between those whose ancestors fell off the Mayflower and those who once chummed up with Flores Magon. If you don’t know that name, don’t be too surprised; our history books ignored it. Ask one of the Mexican American kids. They’ll know who he was and the perspective they share will be worth the time spent learning it, which is better than anything Jan Brewer and the Arizona legislature is up to these days. What’s with Arizona? The state is unhinged. And armed. Speaking of armed, Arizona is one of four states in the country that allow patrons to carry loaded weapons into a bar. While that’s beyond comprehension, it is what it is. My liberal friends who live in Zonyland have learned to take it all with a grain of salt (along with their tequila shot in hopes of not getting shot). Thanks for the excellent article, John. Last Friday night on KPBS, Independent Lens aired a program titled “Precious Knowledge” on the subject of this attempt to suppress an important element of both Arizona and U.S. history. It will air again tonight at 11 pm. The program illustrates perfectly how some people can filter anything they see or hear through their own prejudiced beliefs and come up with interpretations that (in my opinion) are absolutely the opposite of what I took away from this program. Al Madrigal, of the Daily Show, interviewed Tucson school board member Micheal Hicks. Hicks explains why he supports the ban. Don’t miss it. The big irony of this is that Tucson if one of the more culturally diverse cities there. I would even go so far as to say one of the more liberal, at least based in my experiences there and the people I know who live there. Sometimes I wish I could move back to CA..She and Joe make us look like fools…!!! When we go to New Mexico next month we may buy some land to open up a refugee camp for Arizonans who are as embarrassed as we are to be from such a state. Of course we’ll be back in OB in October. We love you all. And what did the Mexican-American War set in motion? manifest destiny….Samuel Clemmons, first supported the american military land grab then switched to become the vice-prez of the the Anti-Imperialist League….is this taught today, anywhere? The whole truth cannot be taught under any capitalist government. If facts leak out, the american system manages to smash, cover-up or co-opt the problem, always. The flea/pimp arpaio knows exactly what time it is. He and his masters know that time is getting late… there are 1/2 billion potential illegals south of the Alamo. These millions, to our south, are witness to america’s foreign policy since it’s beginning. How many dictators? Then there’s all of us Chicanos/Xican@s. Prediction, the slogan “Aztlan, love it or leave it” will take it’s place among the great battle cries in history. arpaio and his cowards choke on the word Aztlan. That’s a good thing. Back to manifest destiny, it failed and will continue it’s fail until it is replaced, not by Chicanos alone but with all our allies, in the millions, who are finally beginning to realize Our Americas is worth fighting for and the term Citizen of the Americas needs become a common unifying identity. The choice is the same today for all who doubt what’s on the horizon…one choice, Sitting Bull or generalisimo george armstrong custer…… no custer, no troops, no troops, no cops, no cops no power left for the 1+%. The yanquis are the enemy of humanity; this is proven daily…….No reason to get excited, for this is not our fate. Raza studies are not about guilt tripping. they are about ending oppression. Occupy has fingered the oppressors. Today, it’s militants in the making (facing the cops toe to toe without weapons–that can change) , tomorrow the workers may wake up and step up…it’s what we, Raza, have been up to, more or less, since 1846….Freedom and liberty are something you take…it can’t be given or bestowed….A specter haunts the 1% of Canada…..Quebiqouis…French-Canadian students. More proof the battle is joined……..
PS Elections? What elections…we ain’t got to show you no stinking elections. @Librotraficante... is fighting for our culture.